If your dog has a light-colored coat, or a relatively thin coat, it’s a good idea to apply sunscreen anytime they will be spending any time outdoors on a sunny day. Similarly, for those dogs that will be spending a lot of time outdoors on a sunny day, regardless of their coat color or thickness, it’s a good idea to apply sunscreen. Pay particular attention to your dog’s ear flaps, their (often) bald belly, and the tip of their nose. These are the areas most likely to get the most exposure. You’ll want to avoid sunscreens that contain PABA, salicylates or zinc oxide, especially on the areas that your dog is likely to be able to lick off. Many sunscreens designed for babies would be ok, but there’s also one FDA-approved sunscreen for dogs — Epi-Pet. 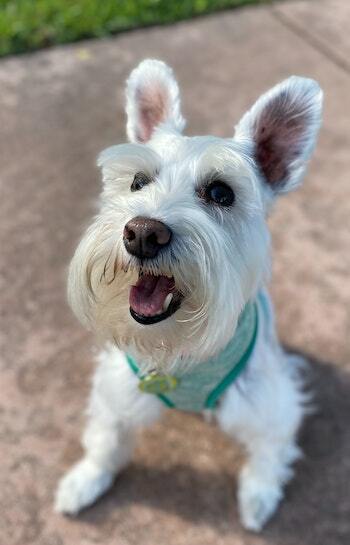 Check out this article for more types of sun protection, even for indoor-only pets and these articles for more information about common summertime dog safety hazards and how to keep your dog cool in the hot outdoors.